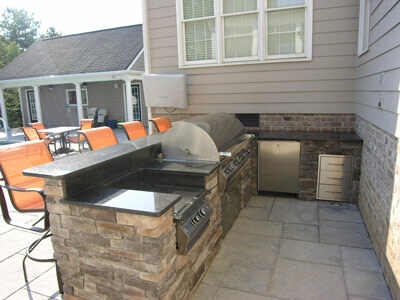 With hundreds client installations in the Richmond area, we have the expertise to help you plan your outdoor kitchen. We have pictures and plans at our showroom for all the completed jobs as well as the ability to do a 3D rendering of your planned kitchen inserted into a real digital picture of your deck, patio, screen room, etc. We know the brands and features that are desirable and can match your budget and entertaining plans to the right products. With all of this design experience, we still match competitor's prices on the wide range of products that we carry. After interviewing you in our showroom to determine how you will use your outdoor kitchen area, we then complete an initial simple drawing to confirm that we've heard your needs. 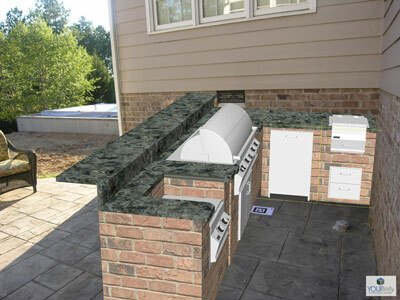 Then we tape it out on your patio to see how you think the workspace will flow for your needs.